It is Yoga for Runners Week here at RCR, so we will be featuring two guest posts by Katie Fox-Boyd of DC Yogi. A few months ago I taught a “yoga for athletes” workshop to a group of pre-marathon runners. We focused on strength building, stretching to release tightness in certain parts of the body, breath work to improve oxygen intake and calm nerves, and restorative poses to relax and rejuvenate. Following the class, I heard from many of the students who told me they would use many of the tools in the upcoming weeks of training. I am not a long-distance runner, but I dabble with a few miles here and there. After I run, I always end up practicing a little yoga. It is just a natural pairing and I believe that yoga is the perfect cross-training for runners. Below you will find what I believe to be the top 5 reasons yoga benefits runners. 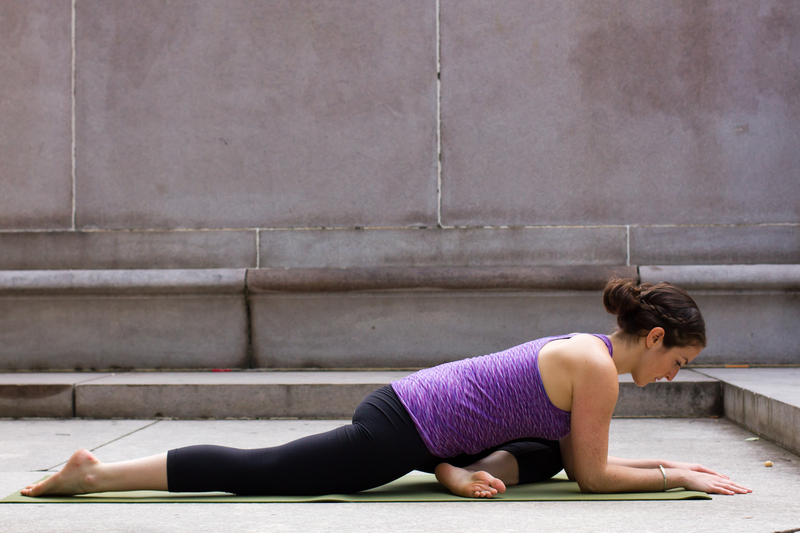 A well-rounded yoga practice builds strength evenly in the muscles, joints, and ligaments. Running requires repetitive motion which over-utilizes certain muscles while leaving other supporting muscles out. Yoga is well balanced so you will strengthen supporting and underutilized muscles. Many poses also provide release through deep stretching of the ligaments and muscles. The physical and mental practice of yoga leads to increased range of motion, body control, muscular symmetry, energy levels, and overall strength and flexibility. Yoga prevents injury by, not only increasing flexibility and strength, but building mental awareness of the body and the signals it will send you when injury is on its way. Yoga also improves alignment in the body so that poor positioning during performance will not lead to injury. The breath is a powerful tool and in yoga the pranayama, or breath work, is a practice that will increase your oxygen intake and teach you to breathe correctly. Through a well-balanced yoga practice that includes breath work you will benefit from a more relaxed mental state. Deep breathing can help reduce performance anxiety or allow you to better manage the mental intensity of body work. So when you hit that last mile of a long run, you have the know-how to optimize your breathing. Yoga is not just about the physical postures but also mental practice. In yoga you cultivate improved concentration and the ability to overcome the ego telling you that you can’t do something; confidence is built on the yoga mat and transfers over when you are lacing up for a race. An important part of any athlete’s bag of tricks is recharging between workouts. Practicing yoga helps to reduce fatigue, improves sleep, clears the mind of worry, and reduces physical tension. Yoga provides ways to calm the nervous system when stress or anxiety set in. So there you have it, to me combining a yoga practice with your regular running routine is a no-brainer. If I haven’t sold you on the many benefits of yoga for runners, then stay tuned and try it yourself. Later in the week I will provide a simple yoga sequence geared specifically toward runners. About the Author: Katie Fox-Boyd is a Washington, DC based registered yoga teacher and the fiancee of RCR founder Doug Hay. Check out her blog DC Yogi where she shares her advice and musings, for the beginner yogis and those with a beginner’s mind.